It’s been a crazy few weeks full of teething toddlers, illness, and more teething. OH MAN, the teething. When I was pregnant, I used to have weird dreams about Little Pea being born with a full set of adult teeth and I’d wake up feeling creeped out, but now I’m kind of wishing that had actually happened. Would it be unsettling? YES. Would it be worth it? YES. Back to the topic at hand: Banapple Bread. I have a vegan banana bread template that I make when we have overripe bananas on hand, with different tweaks and add-ins—usually blueberries or chocolate chips, sometimes chai spices. 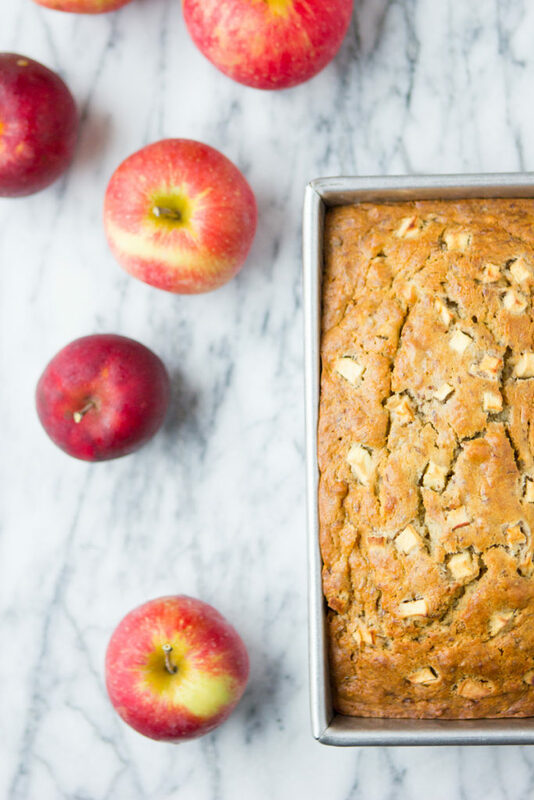 I’ve never made it with apples, but since we’ve got a crisper drawer full of them from apple picking, I thought I’d put them to use in our favorite banana bread. And it was good!